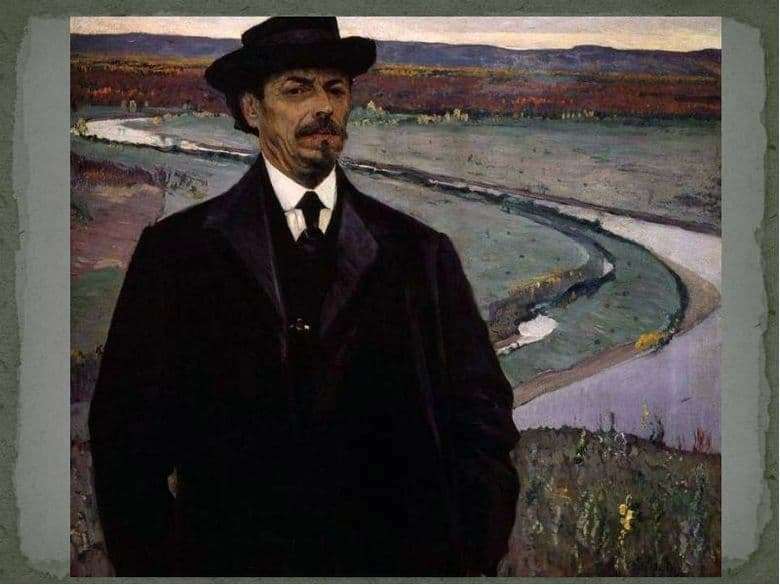 The painting, painted in 1928, is a canvas depicting the great Russian artist Nesterov himself. Interestingly, the painter depicted himself in restrained colors, paying more and more attention to facial expressions, facial expressions, and gaze. Nesterov is considered a skillful master of his craft and the greatest portrait painter, however, it is much more difficult to depict himself and his inner world. The philosophy of this painting lies in the fact that the artist is trying to find himself present, without embellishment and unnecessary colors. The focus is on the eyes and the look, since it is the eyes of a person that reflect the essence of the soul. In the picture, a modest, but at the same time elegantly dressed man with glasses appears to the viewer. On his face one can notice serious thoughtfulness and the desire to penetrate the soul to the audience. Looking at the picture, one gets the impression that the artist wants to know how he appeared before the viewer, whether he is pleased with the artist, or the ideas do not agree with reality. The artist’s face expresses the mystery and desire to understand his audience, who will look at him. I wonder what the artist was thinking in the process of writing his self-portrait. The most interesting thing is that Nesterov began to paint portraits after the revolution in Russia. The events that took place in his native country left an indelible impression and led to the fact that the artist began to pay more attention to portraits. The Russian artist began to attract the personality of the person who creates destiny, and this time he became himself. The artist depicted himself without excesses, to show the person that the soul is much more important. Using shades of dark colors, the artist does not separate himself from ordinary people whom he depicted. Everything is beautiful in this picture – the reaction of the viewer and the surprised expression of the artist himself.